Lens Description: For photographers who enjoy a wide variety of shooting styles, the Nikon Zoom-Nikkor is the lens for the job. This zoom camera lens can shoot pictures at a focal range of 18 - 55 mm. 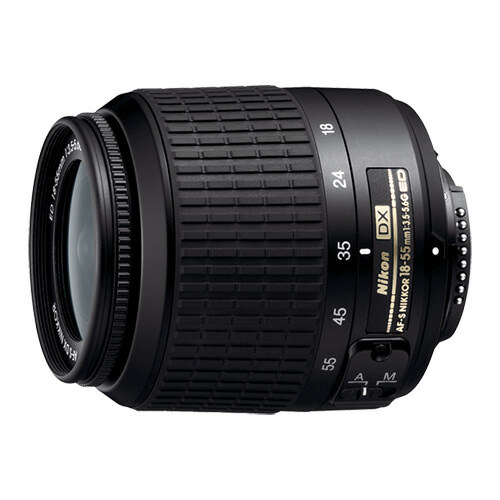 The aperture of this Nikon camera lens is also variable - users can adjust it from 3.6-5.6/f to suit the sharpness and brightness they want in their finished pictures. This zoom camera lens is also a wide-angle one, making it useful for photographers who like broad subjects like landscapes or sports fields. Weighing in at a mere 7 oz, the Nikon Zoom-Nikkor is light enough to carry easily, even for hand shooting trips that take hours. Nikon\'s Super Integrated Coating helps this Nikon camera lens produce images with excellent color quality, and minimal flaws such as flares. The Nikon Zoom-Nikkor is compatible with Nikon brand digital SLR cameras, and uses a Nikon F mount.